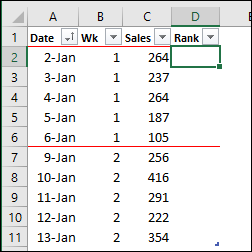 Use the RANK function to compare numbers to other numbers in the same list. See the steps in this video, and the written instructions are below the video. If you give the RANK function a number, and a list of numbers, it will tell you the rank of that number in the list, either in ascending or descending order. For example, in the screen shot below, there is a list of 10 student test scores, in cells B2:B11. Then, copy the formula from cell C2 down to cell C11, and the scores will be ranked in descending order. 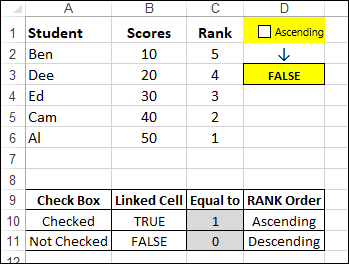 order: (optional) This argument tells Excel whether to rank the list in ascending or descending order. Use zero, or leave this argument empty, to find the rank in the list in descending order. In the example above, the order argument was left blank, to find the rank in descending order. For ascending order, type a 1, or any other number except zero. If you were comparing golf scores, you could type a 1, to rank in ascending order. In the RANK function, the 3rd argument (order), is optional. 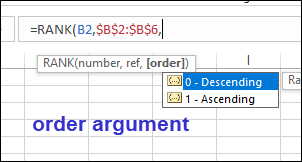 The order argument tells Excel whether to rank the list in ascending or descending order. If you use a zero as the setting for order, or if you don't use the 3rd argument, the rank is set in descending order. The 5th largest number gets a rank of 5. If you use a 1 as the setting for order, or if you enter any number except zero as the 3rd argument, the rank is set in ascending order. The 5th smallest number gets a rank of 5. 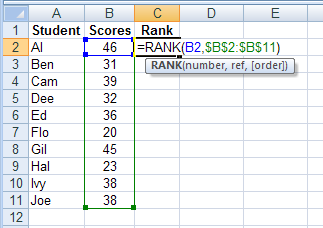 Instead of typing the order argument number into a RANK formula, use a cell reference, to create a flexible formula. For example, type a 1 in cell E1, and link to cell E1 for the order argument. 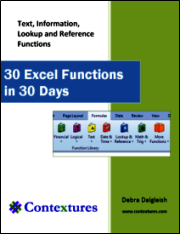 NOTE: Be sure to use an absolute reference ($E$1), if the formula will be copied down to other rows. If you use a relative reference (E1), the reference will change in each row. By linking to a cell, you can quickly see different results, without changing the formula. 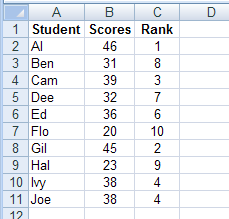 Type a zero in cell E1, or delete the number, and the rank will change to Descending order. For the order option, there are only 2 choices - Ascending or Descending. To make it easier for people to change the order, use a check box to turning Ascending order ON or OFF. In the RANK function sample file, there is a check box example on the RankOrderCheck worksheet. 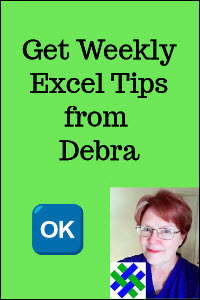 For instructions on how to add a check box, and use it in a formula, see my blog post, Use Check Box Result in Excel Formula. 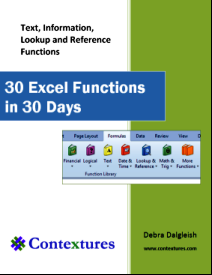 how to choose options for SUBTOTAL and AGGREGATE functions. What happens to the ranking if some of the scores are tied? 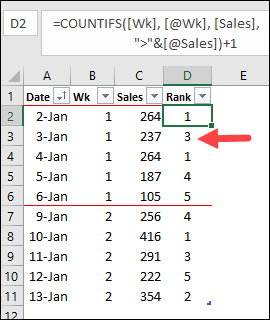 Excel will skip subsequent numbers, if necessary, to show the correct rank. In this example above, the last two scores in the list are the same -- 38. The two students, Ivy and Joe, are both ranked as 4th. The next highest score -- Ed's score of 36 -- is ranked as 6th, not 5th, because there are 5 students ahead of him. If you have to break the ties, or award prize money based on ties, there are examples below. In some cases, ties aren't allowed, so you have to find a way to break the tie. In this example, you could keep track of the number of minutes that each student worked on the test, and use that time to break any ties. If scores are tied, the student who takes less time to complete the test will rank ahead of the other student with the same score. 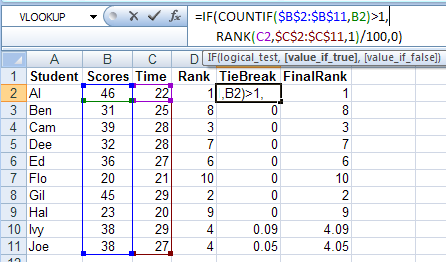 I added the Test Times in column C, and a TieBreak formula in column E.
The Tie Break formula uses COUNTIF and RANK functions, wrapped with an IF function, to see if a tie breaking decimal amount should be added to the original Rank. Next, it divides that amount by 100, to get a decimal amount. Later, you'll add this decimal amount to the original Rank. Note: The divisor, 100, could be changed to another number, if you are working with a longer list. Finally, to complete the IF function, if there is only one instance a a Rank, the result for the TieBreak is zero. After calculating the tie breaking decimal amounts, you can add the RANK function results to the TieBreak results, to get the final ranking. In this example, two students were tied in 4th place. Joe took 27 minutes to complete the test, and his Time was ranked 5th. Ivy took 29 minutes to complete the test, and her Time was ranked 9th. The Tie Break formula adds a decimal of 0.09 to Ivy's score, and 0.05 to Joe's score. In the final ranking, Joe, with 4.05 ranks higher than Ivy, with 4.09. In a tournament, instead of breaking the ties, you might want to split the winnings among any tied players, if you're awarding a cash prize, or points. To see the steps for splitting the winnings, watch this short video. The written instructions are below the video. In a tournament, instead of breaking the ties, you might want to split the winnings among any tied players, if you're awarding a cash prize, or points. If 2 or more players have the same rank, they split the prize amount available for that rank, down to the next occupied rank. Below is a sample prize table, showing the amount awarded for each rank. In this example, if 3 players are at rank 1, they would split the total amount (10+9+8=27) for ranks 1, 2 and 3. 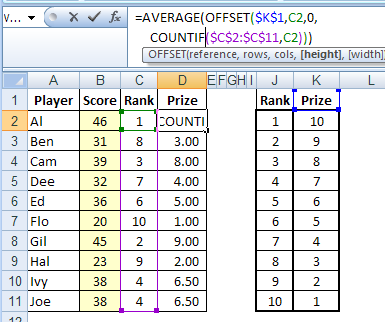 To split the prize amount among tied players, the Prize formula uses the AVERAGE function, with the OFFSET function finding the range of cells to average.This formula is entered in cell D2 and copied down to cell D11. The Prize formula uses the AVERAGE function, with the OFFSET function finding the range of cells to average. In the OFFSET formula, the 1st argument is the reference cell. In this example, that is cell K1 -- the heading for the Prize amounts column. Instead of using the RANK function to compare a number to an entire list of numbers, you might need to rank a value within a specific subset of numbers. For example, rank each day's sales compared to other days in the same week. In the screen shot below, there are sales records for two weeks. Jan 2nd and Jan 4th have the highest sales in week 1, so they should have a rank of 1. In week 2, Jan 10th has the highest sales, so it should have a rank of 1 for that week. There isn't a RANKIF function, but you can use the COUNTIFS function to calculate the rank based on items with the same week number. The second criterion find items with a larger amount in the Sales column. Then, 1 is added to that number, to get the ranking. For example, in week 1, look at the sales for Jan 3rd -- 237. 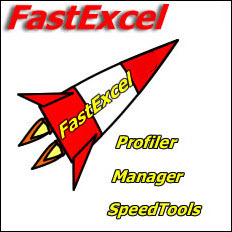 Download the zipped sample Excel RANK Function file. The file is in xlsx format, and does not contain macros.